As part of a recent visit to Norfolk, I was heading to visit one or two retreats (one after the other) for some very different head-to-toe pampering at each location, involving some superb food too of course. 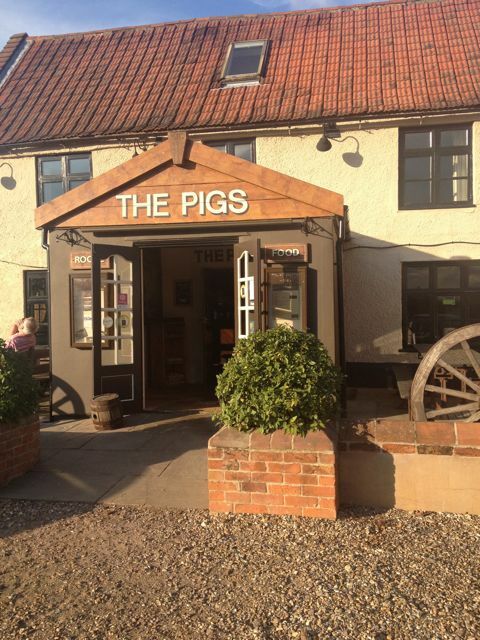 After some hunting around online, a luxury bed and breakfast called “The Pigs” in Edgefield (just 4 miles from Holt) caught my attention and a room was booked quick sharp for the ultimate evening of self-sufficient pampering. This wasn’t just any room… This was a private spa room, at first glance this is the main appeal for this venue, not forgetting the special and meat-fiend friendly restaurant menu of which just HAD to be sampled. 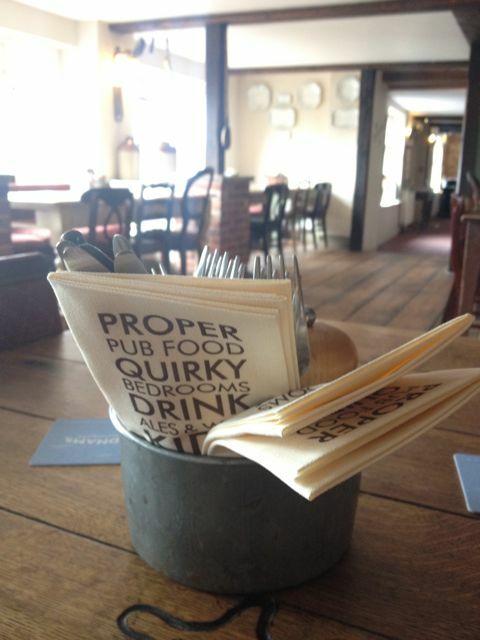 The Pigs is a 17th Century country pub FULL of character. 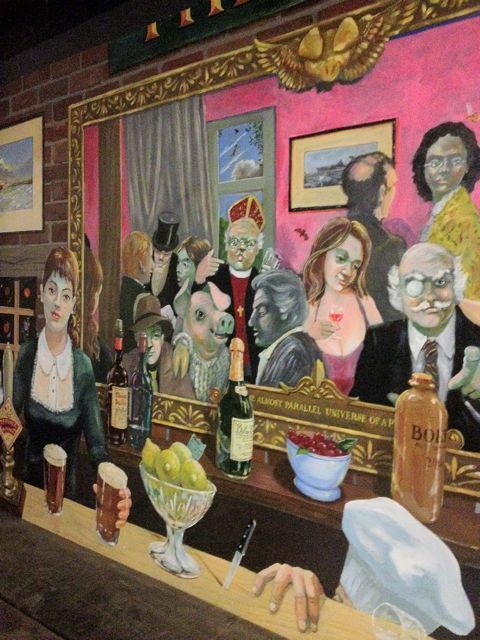 As soon as you step foot through the front door you are greeted with a rather trippy, yet eye-catching mural on either side of the porch doorway and you can’t help but stare at it every time you walk through it, spotting the pigs in this quirky painting as you do. 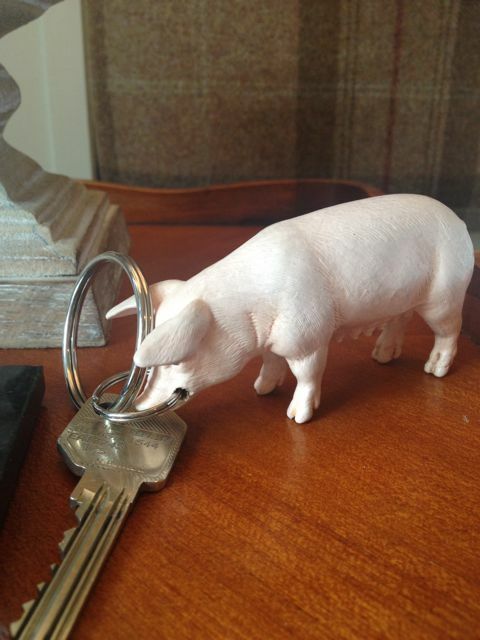 It doesn’t stop there, there are pigs in all shapes and sizes, as the name would have you believe there should be… Even your room key is a plastic pig of which you couldn’t possibly lose in your handbag! It’s ownership is a three-way venture made up of 3 well known local people: Richard Hughes of the Lavender House at Brundall, Iain Wilson, of the nearby Byfords and Kings Head in Holt, and Tim Abbott, chef / landlord of the pub and day to day Pig In Control. And they’ve got this place right in attitude, luxury and service. The Pigs has ten luxuriously unique and “rustic country style” bedrooms (six of which are spa rooms) over three floors, all kitted out with a large desk to work at with free wifi, bathrooms with underfloor heating and Drench showers (ours had a waterfall and rainforest function, both not making me want to leave the shower ever again!) and 6ft pocket sprung beds, with the exception of Room 1 being host to Norfolk’s (supposedly) only 8ft bed – had I known this, I may have requested giving that bad boy a go! On checking in at the bar, the lady who gave us the grand tour was very friendly indeed, made sure we were ok with everything and even showed us the restaurant and advised us on times, should we want to dine that evening. She felt more like a friend, it was the first thing we discussed once she had left us to settle in, it felt very homely indeed. 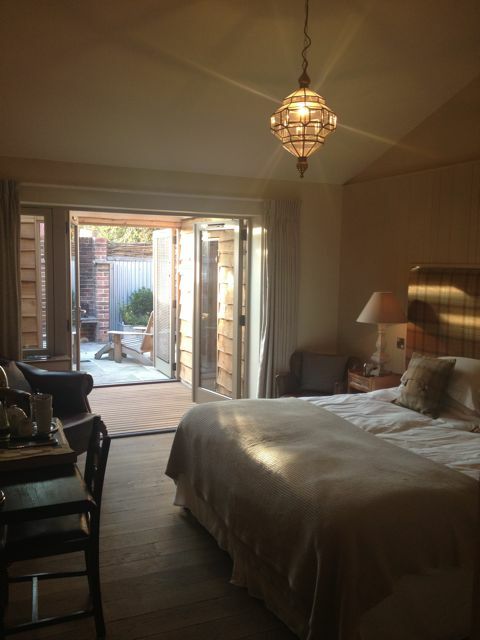 We were checked into room 8, a spa room which included all the little luxuries…and then some. 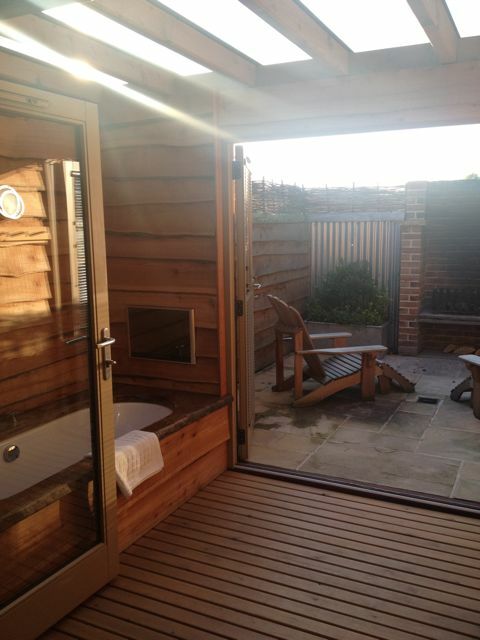 We had our own private sauna, outside heated bath with built-in TV (of which I enjoyed watching “The Great British Bake Off” from) and a fire pit with wooden loungers to enjoy an al fresco marshmallow toasting session on. If that wasn’t enough, this room also played host to a widescreen TV and surround sound system of which I could even plug in my specially created “relaxation” playlist and hear it in the sauna and outside areas too, this was a fantastic bonus and I particularly loved this touch. The bed was the comfiest hotel bed I’ve slept in for a long time, no ridges, it was a proper king sized bed, not twins pushed together as some rooms can offer. With a better choice of pillow, this bed would be ALMOST as good as my own! 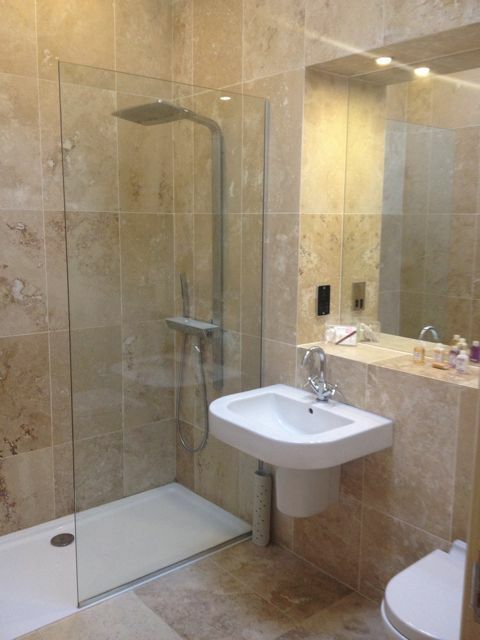 I loved that I could pull on a warm bathrobe from the en suite bathroom and head straight to my own private sauna, of which had simple instructions for the “technically challenged” to operate and enjoy in 20 minute bursts. The heat wasn’t as much as most large spa saunas, however the warmth was intense and I feel it may have been a good calorie loser as you sweat buckets in this baby… I’m truly glad it was pristinely clean on arrival, that’s all I would say! The little bottles left to use included the usual shampoo, conditioner, body lotion and shower gel, but also some bubbles for the outdoor bath which was a lovely thought as well as access to some gorgeous orange scented oil for the sauna too. Many different cuts of pork are offered and we went for there very own Norfolk version of tapas for a nibble, also listed as “Iffits” priced at £6 for two which we felt was fantastic value for the amount of food served on our platters. The “Perfick pork mini bangers” which were cumberland, caramelised red onion and black pudding sausages (almost posh cocktail sausages on sticks) with a red onion jam and mustard mayonnaise were ALL delicious and we literally “mmmmm’d” our way through them. We also sampled the “Kilner jar of potted pork” with mini toasted “soldiers” and a deliciously sweet apple chutney. My dining partner and I both decided on the Minced rump burger for a main, which most certainly did not disappoint. This burger was held in place between two sides of a lightly toasted and homemade English muffin (not a breaded article that I have ever tried with my burger, but it worked perfectly as it didn’t detract from the main feature).. the burger wasn’t over seasoned and had a deep taste of red wine, it was gorgeous and with the hand cut chips cooked in beef dripping they really don’t do anything by halves. The restaurant is dark and candlelit which adds a relaxed feel to an evening meal here and the couple next to us ordered the full on 8 hour slow-cooked shoulder of lamb with all the trimmings and it came out with the waitress in celebratory style, it’s definitely a place that likes to play with the food and encourages its diner to do so too. Needless to say, there was no room for pudding! After a fairly rich meal the previous evening, the 15 mile breakfast with smokey bacon beans, sausage, black pudding and butter poached double yolker sounded fantastic, but wasn’t going to happen for either of us! Between us we opted for the “Perfick Pork Sausage” and roast onion sandwich and I asked (being awkward of course) to have some toast with poached eggs which was my fancy on waking up that particular morning. 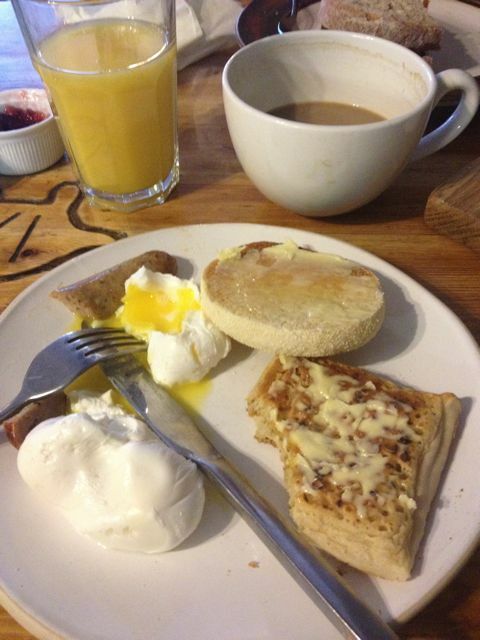 The toast came out on a large wooden block and offered me different breads, muffins and homemade crumpets with lashings of butter, of which I wasn’t expecting. The service was once again friendly and consistent, it really can’t be faulted as nothing was too much effort. And the coffee… oh the coffee! Forget your small cappuccino cups here, we were handed two enormous vats of freshly brewed coffee straight from the kitchen and a huge canister of milk to keep us going, they obviously knew Miss Sue Flay was coming and how grumpy she would be without her fix! No room service at The Pigs, but actually, this is no bad thing. It meant that we got up early, enjoyed the spread (including the melt in the mouth warm croissants and various homemade jams whilst waiting for our coffee) which is something you wouldn’t experience if you were lazy daises! It also meant that we could go back to the room and enjoy a second round of pampering before checking out later that morning, which simply had to be done. The only downsides to The Pigs would be that this venue is situated on a busy road, so traffic noise was a pain when bedroom doors were open. It also meant that sitting out using the fire pit wasn’t the relaxing evening I had dreamt in my head when booking. If this place was picked up and dropped into the countryside, it would be PERFECT. There was also no easy way to light the fire other than chuck a load of firelighters on it, as no kindling was found, so the fire went out very quickly and caused us to smell to high heavens of smoke once we were done, very unromantic! In regards to the bed, for me personally, the pillows were too flat, I like a thick and solid pillow for a good sleep, but these were very thin and lost even more padding as I laid my head on them. In the corridor of the B&B there was a small bar stocked with wines, beers and soft drinks, a fresh fruit bowl, marshmallows & skewers and the oil for the saunas. Alongside it was a price list and the “Honesty Pig” of which you as a guest are entrusted to put the right money in after hours. I really liked the trust that the team put into their guests and as a result, you do treat it with the respect it deserves. I also purchased some locally sourced free-range eggs and a couple of bottles of their very own ale to take home and enjoy for dinner the next day. The eggs were nestled in the front doorway and again, your honesty is respected and they allow you to pay at the bar and take your agreed number. The Pigs is perfect for couples, lone travellers, even families (as there are kid friendly menus, even an indoor games room and posh outdoor play area complete with a treehouse and zip wire, simply called “Piggleplay”) and is part of the Byfords Posh B&B in Holt, just a few miles away and well worth a visit whilst in the area. On checking out we were handed the invoice aside an unexpected paper bag stamped with the pub logo and it was filled with rhubarb & custard sweets to fuel our journey home. The quirks kept on coming, with no tacky feedback form emailed to us afterwards, which was refreshing. Our stay in the Spa room with breakfast was £165 per night and felt like a bit of a risk when booking, as this was a treat for us, but it was worth every penny and I would hand on heart visit again in the future – preferably sat by the fire whilst enjoying a pint of Adnams Ghost Ship. You can view my full photo album for this venue by clicking here.